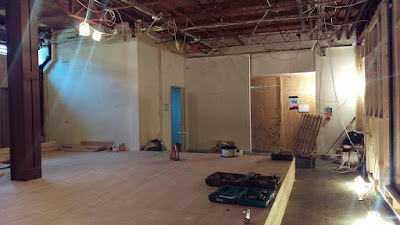 That’s my way of apologising for the rather late blog post to say that the transformation work has commenced for both of these spaces - with a target completion date in June 2016! A quick shout out to our project manager, Marc Newsome, who is our internal star seeing these two spaces through to completion. SDL Construction have been busy stripping the spaces back to their outer shell and starting work to implement the new designs. You can see the start of D/056’s new raised seating area below, and we will have more photos to whet your appetite soon. V/044 as a high-quality boardroom seminar, with full blackout facility, a large central projection screen (3 metres), new lighting, heating, power, carpets, glazed windows (and curtains/blinds), tables, chairs and entry doors. Our Interior Design company working on the project, Brazenose, are as passionate as us to deliver a high-quality learning environment. D/056 as a high quality small collaborative lecture room. This is our first truly collaborative room, with bench seating and collaboration tables for all members (with integrated power), new lighting, technology (large central projection and large boards), heating, power, carpet, glazed windows (and blinds), entry doors and new ventilation. For those of you who remember D/056 - we believe this space will be truly transformed and unrecognisable when we’re finished!